Best Christmas Display of Lights in Homes in Mission Viejo 2012! Posted by Teresa Mihelic HelpDesk on Thursday, December 20th, 2012 at 5:08am. As part of the many cities of Orange County encouraging their residents to decorate for the holidays, Mission Viejo residents came up to the plate and shared, and continue to share the holiday spirit by competing in the annual Holiday Lighting Contest, that has been hosted for over 30 years by the Mission Viejo Activities Committee. 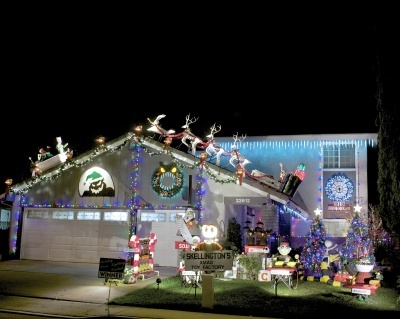 • Light Up the Neighborhood Award for the most decorated street. Prize is a block party hosted by the MV Activities Committee. Map to the locations of Mission Viejo winning homes can be found clicking in this link. Don't forget, that the last day of 'Santa's workshop', where you can come and bring the children for a picture with Santa and his elves, is today, Wednesday December 19th 2012. Santa will be in his workshop from 6:00 - 8:00 p.m. Place: Civic Center Plaza (200 Civic Center Dr).